Lona Fetty Wamsley during a birthday with family members, including great-granddaughter Rylei Wamsley, granddaughter Jackie Wamsley, great-grandson Caiden Wamsley and grandson Logan Wamsley. 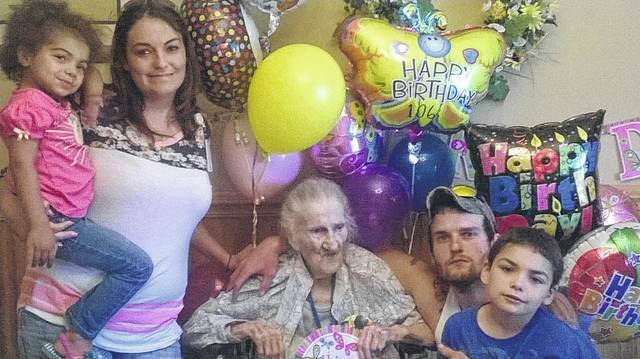 GALLIPOLIS — Lona Fetty Wamsley turned 108 years-old Saturday, having lived a lifetime among historic changes and with the love of her family. She was born June 9, 1910 in Point Pleasant, W.Va. and was raised by her sister, Eva Murphy, after their mother’s death. She lived through the days of the Great Depression and “Herbert Hoover’s days,” while witnessing shanty boats going up and down the Ohio River as makeshift homes and businesses. She credits Jesus and God with having “been good to her” throughout her life and says Christian hymns are her favorite kind of music. Red tomatoes have been a regular feature among her meals and she has credited them in part also with her long life. According to information previously shared with Ohio Valley Publishing, she married Cecil Ray Wamsley in May 1937 and shared one child, Ken Wamsley, with him. In 1936, Lona battled a gall bladder attack during the famous flood of the year. While they couldn’t reach medical care through the water-filled roads, her husband brought her to a doctor on the Ohio River over a stubborn and rough waters. She and Cecil helped with search and recovery of victims following the collapse of the Silver Bridge while he was employed by Bob Bosworth with the O-Kan Harbour Barge Company as a deckhand. She was a homemaker before her husband died in 1971, after which, she became a cook on a riverboat. She would leave Ken in the care of Clarence Stutler when working. Lona has four granddaughters, a grandson and two great-grandchildren, Caiden and Rylei. Her son and his wife Patricia continue to live in Gallia and visit. Wamsley family history says its members previously lived in West Virginia before making their homes in Delaware, Ohio, and Gallipolis. Lona has lived in Gallipolis since moving to the area. Lona currently resides at Holzer Assisted Living in Gallipolis.